SDCC 2011 – Hasbro Booth – Final Thoughts! | The Fighting 1:18th! 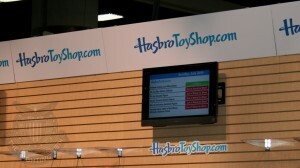 Home > Conventions > SDCC 2011 – Hasbro Booth – Final Thoughts! SDCC 2011 – Hasbro Booth – Final Thoughts! Whew. That was a week! The San Diego Comic Convention is finally winding down, with Sunday being a half day, most booths are trying to give away whatever they can so they don’t have to haul it back home. The Hasbro Toy Shop booth is no different.. there were no tickets to wait in line for today, no pushy lines, no awesome security guards to talk smack, just lots of people trickling in to grab whatever was left at the show (Which was advertised as not much). One surprise though, they found a case of Starscream’s (12 or so), and had them stacked behind the counter for sale, but since the sign advertised they were sold out for the show, many people didn’t bother waiting in line, and they were not selling as quickly as you’d imagine.. some lucky people will be walking away with a prize today for sure! The Indiana Jones sets were about the only good thing left in stock, though the numbers on that seemed to be dwindling as well as people were left with few other options. Even the Star Wars set sold out yesterday! And those crazy Transformer things too. Want a Thor Hammer? You’re in luck! I got CONCRETE information on the HTS.com availability issues, direct from a HTS employee who was as tired of the convention as I am right now. There WILL be product available on HTS.com for all the Joe items (Both Zarana’s and Starscream), but they will be pretty limited in number. HTS.com tries to sell all the product they can at SDCC, but there is a California law that requires them to hold back some percentage of inventory for some reason or another (Probably defective products, or something). Generally this hold-back quantity is what gets put up on HTS.com. Since this seems to be a percentage, the smaller the overall production run, the smaller amount HTS.com is likely to sell. Unfortunately I could not get exact quantities, but should be more than Sarge last year, but they will go quick again. Time-frame? Of course. It will be either Tuesday around 9AM EST, or Wednesday 9AM EST. The HTS staff are flying back on the red-eye tonight, through tomorrow and so they may not be able to get everything counted and ready for sale by Tuesday morning, and if not, it’ll be pushed back to Wednesday morning. From the way they were talking, they’d like to be ready by Tuesday but reality seems to point to Wednesday. If you are dead-set on getting one of the items I’d be available both days. Prices @ SDCC were with CA sales tax included (ridiculously high), so the HTS.com prices will be somewhat lower, but I do know you end up paying tax on most of the items anyway. I think the Zarana should be around $13.99 and the Starscream should be around $49.99 or so. The Hasbro booth had no additional changes to the Joe section, and most of the Joe-team had gone home already, Sunday is the day everyone wants to be back in their own bed. Got some additional pictures of random things, and the staff here will be posting more in-depth coverage over the next couple weeks. Comic Con is over! WOO-HOO! Time to get on the road and sit in traffic for a few hours..
Special thanks to Harold Shaw (Former Patriot’s player, and current Hasbro security) for being awesome, all the HTS staffers and of course the nice folks at Hasbro who put up with our inane questions and requests day-in and day-out. See you next year! 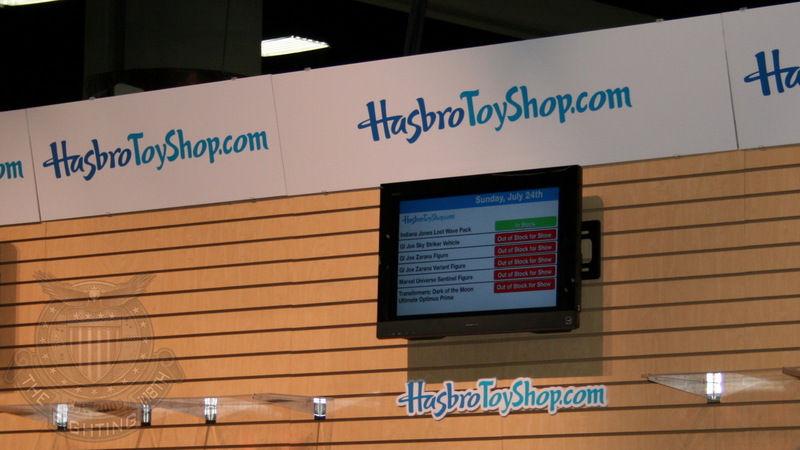 Previous: SDCC 2011 – Hasbro Booth – Exclusives SOLD OUT! Wow, great wrap up and intel, NSA. Your time, energy and devotion are much appreciated!